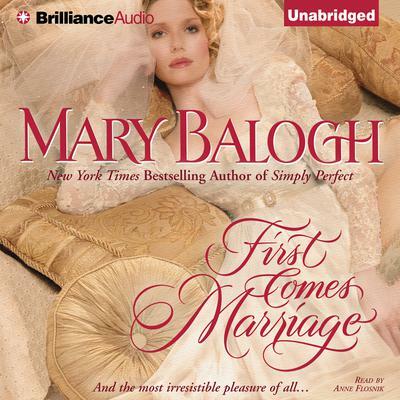 Against the scandal and seduction of Regency England, New York Times bestselling author Mary Balogh introduces an extraordinary family — the fiery, sensual Huxtables. Vanessa is the second daughter, proud and daring, a young widow who has her own reason for pursuing the most eligible bachelor in London. One that has nothing to do with love. Or does it? The arrival of Elliott Wallace, the irresistibly eligible Viscount Lyngate, has thrown the country village of Throckbridge into a tizzy. Desperate to rescue her eldest sister from a loveless union, Vanessa Huxtable Dew offers herself instead. In need of a wife, Elliott takes the audacious widow up on her unconventional proposal while he pursues an urgent mission of his own. But a strange thing happens on the way to the wedding night. Two strangers with absolutely nothing in common can’t keep their hands off each other. Now, as intrigue swirls around a past secret — one with a stunning connection to the Huxtables — Elliott and Vanessa are uncovering the glorious pleasures of the marriage bed…and discovering that when it comes to wedded bliss, love can’t be far behind.